Stokes (Chronological Order of Shakespeare's Plays) shows that it was written before 1606 by the fact that in the quarto of 1622 (i.1.4) we find the oath "S'blood" (God's blood), while this is omitted in the folio. This indicates that the quarto was printed from a copy made before the act of Parliament issued in 1606 against the abuse of the name of God in plays, etc. So "Zounds" and "by the mass" (in ii.3) are found in the quarto but not in the folio (293). Eighteen years passed before Othello was first put into print in 1622 by Thomas Walkley. Walkley's was a quarto edition, known as Q1, and it was the last Shakespearean edition of a single play before the collected edition, known as the First Folio (printed by Heminge and Condell in 1623). Othello was one of Shakespeare's most popular plays throughout the 17th century. The preface to the first quarto tells us that the play "had beene diverse times acted at the Globe, and at the Blackfriars by his Majesties Servants", and the Allusion Book records that from 1591 to 1700, Hamlet is referred to most often in contemporary literature at 95 times, while Othello is fifth with 56 references (Brooke, 176). The famous Renaissance actor Richard Burbage was the first Othello, and was amazing in the role according to tributes made to Burbage after his death in 1619. Through the Restoration and Queen Anne periods a number of great actors played the role of Othello, but only one was able to live up to Burbage: Thomas Betterton. Colley Cibber wrote that Betterton was "an actor as Shakespeare was an author, both without competitors, formed for the mutual assistance and illustrations of each other's genius." We have no record of the first Iago, but Joseph Taylor, an actor with the King's Men from 1619, was acclaimed in the role of the voluble villain, and during the Restoration Michael Mohun's portrayal of Iago was extremely popular. "He amazed his hearers by its loudness and his wonderful rapidity of enunciation of syllables and words. In his rage of jealousy, fire streamed from his eyes, and the emotions of his body were so great that he shook the spangles from off his silk tunic. His was the intellectual face — a face expressing the deep-cut lines of thought; lines that had been helped to their peculiar formation, perhaps more by the struggle, turmoil and worriment of life than by any of the more soothing and tender passions and sentiment which would form the face of one whose life had been more fortunate. His eyes were polished jets, large and penetrating, and produced an instant effect. There was no expression of love in them. Deceit, anger and revenge was their field of power. Coleridge said that "seeing Kean act was like reading Shakespeare by lightning-flashes, so brilliant and so startling were the sudden illuminations, and so murky the dull intervals" (55). Tragically, during a performance of Othello at Covent Garden in 1833, Edmund Kean collapsed on stage into the arms of his son who was playing Iago, and died a few weeks later. 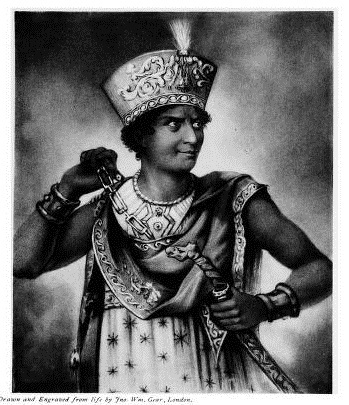 Junius Brutus Booth was another noted 19th century Shakespearean actor who brought a strong interpretation of the Moor to America. William C. Macready played Othello and Iago, as well as all of Shakespeare's other great creations. He was the first to pay specific attention to Othello's moorish garb. In the early 20th century the most acclaimed portrayal of Othello was by Paul Robeson, the distinguished actor and civil rights advocate. Robeson won the Donaldson Award for outstanding lead performance in 1944 for Othello, and the American Academy of Arts and Letters medal in 1944, to name but a couple. James Earl Jones, Laurence Olivier and Laurence Fishburne have also made memorable the character of Othello. Othello has made the transition from stage to film over twenty times this century, and from stage to television at least five times. FYI: William C. Macready's fight with fellow thespian Edwin Forrest caused the worst case of murder and mayhem in the history of theatre: the Astor House Riot. 1. Some historians give her name as Anne Marshall; see Lowe, p. 51 for more on the discrepancy. 2. As Sir Sidney Lee points out, the practice of boys playing female roles on the English stage ended completely in January, 1661 (Shakespeare and the Modern Stage, p.89). Mabillard, Amanda. The History of Othello Shakespeare Online. 10 Aug. 2008. < http://www.shakespeare-online.com/plays/othello/othellohistory.html >. Brooke, Tucker. In Othello. New Haven: Yale UP, 1947. Harrison, Gabriel. Edwin Forrest the actor and the man. Brooklyn, New York: 1889. Lee, Sidney. Shakespeare and the Modern Stage. London: J. Murray, 1906. Lowe, Robert. "Their Majesties' servants." Annals of the English Stage. Philadelphia, McKay Publishing, 1890. Shakespeare, William. The Tragedy of Othello. Ed. G. Lyman Kitteridge. Toronto: Blaisdell Publishing, 1966. Winter, William. Shakespeare on the Stage. New York: Moffat, Yard and Co., 1911.